Welcome to Hate Cards in Modern, where we teach you how to be hateful colour by colour. I’m your host Timmy Tryhard. Ahem. 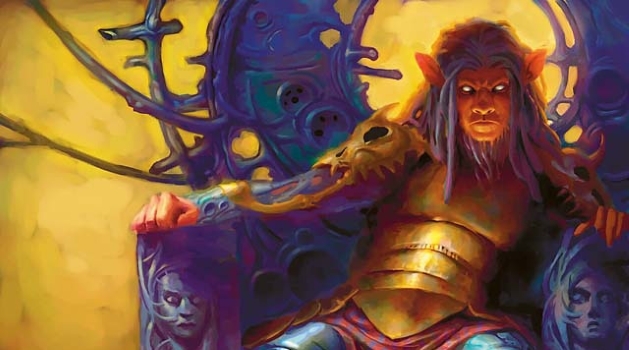 Modern, unlike Standard, is a format defined somewhat by its hate cards, by which I mean cards that specifically target your opponent’s strategy in attempt to lock them out of a win or at least delay them long enough for you to win. Because of the larger card pool, the decks in Modern go more “in” on their strategy, and so, hate cards become quite important. Some find this to be a downside of the format, and while perhaps it could be lessened for the better of the format’s health, I personally enjoy the challenge of fighting through hate in the deckbuilding process and in actual games. Moving on, below are the best, most popular, and most currently relevant hate cards in white, the most hateful of all the colours. Typically these will be in your sideboard, but depending on the meta, your deck, and what the card does, sometimes you can be extra hateful and make it work mainboard. Usually mainboard material, Thalia works great in creature heavy decks that want to slow down creature light decks with lots of answers. You can find this in “Hatebears” decks (which have a lot of hateful creature cards), and even the occasional Elves list. Another hatebear you’ll often find maindeck, Mindcensor is decent on its own as a 2/1 flash flyer, but the search hate can be brutal for decks like Scapeshift, RG Tron, and Amulet. Affinity flat out loses to this if it’s timely enough and doesn’t have the Galvanic Blast, and can still struggle even if the timing is suboptimal. Unfortunately, it only really does work against Affinity, so only use it if the deck gives you a lot of trouble. Hatebear #3. Like the others, he’s decent on his own to hate on the same decks as Mindcensor, but when you consider he turns Path to Exile into the unconditionally best removal in the format, and Ghost Quarter into a Strip Mine, you get the real sense of his power. Run him maindeck with these cards. A card so hateful you don’t even need to be in white to use it. Of course, it’s not usually recommended to go without the hardcast option, as then you’re pretty much forced to run four copies, which in turn requires you to remove four cards from your deck just to have a chance at this working. If you can hardcast it and your deck is capable of holding off Burn and Abzan decks on its own, you’ll find this very powerful whether it’s in the opener or not. It’s recommended you use it in all-in (or almost all-in) decks like Amulet and Auras that just want to slam this, lest they become fragile to discard, or get raced by Burn. Hates on Affinity but a little less harder than Kataki, while proving much more effective against Tron. As a bonus, it’s much harder to destroy for these decks. If you have trouble with both or just dislike the idea of using sideboard slots for one deck, Stony Silence will serve you very well. One of the best hate cards for Burn, and aggro in general. When playing against Burn, try to play it around Skullcrack / Atarka’s Command, but keep in mind even if they do negate the life loss, you still get some valuable tokens. The downside is it only really works in creature light decks. As a bonus, this card has flavour up the wazoo. A lot more relevant these days than it used to be, Rest in Peace (RIP) hates on Snapcaster Mage, Tasigur, the Golden Fang (or Ladyboy, the Golden Wang as I’ve heard him called), and Become Immense, as well as the odd graveyard deck like Gifts Tron. Graveyards can be a very important resource for decks that run these cards, and RIP does well to take that away. You probably never want to run this guy mainboard, but out of the sideboard he’s an extremely potent threat against Abzan, both on offense and defense. Can also work great against less common decks like Stompy. If you run few or no activated abilities yourself, or perhaps you just have enough mana that you don’t have to care, Suppression Field can do a ton of work for you against the likes of Abzan, Twin, Affinity, Tron, and more. A criminally underused card in Modern. You don’t see the Queen of Phyrexia too often because of her high casting cost, but in Reanimator decks, if used in combination with the right amount of control, she can end the game promptly. A real beating against Infect, Affinity, and Merfolk, among other decks. That’s all for now. Next time I’ll cover blue hate cards. Round and round the colour pie we go! Other white sideboard cards worth mentioning: Kor Firewalker and Sundering Growth. Also Rule of Law, Disenchant/clone, Wrath of God etc. White has the best sideboard options of any color. imo.